Examining some questions regarding commercial autonomous and drone ships, as well as why VSAT currently presents the best solution for the communications and control of such vessels. 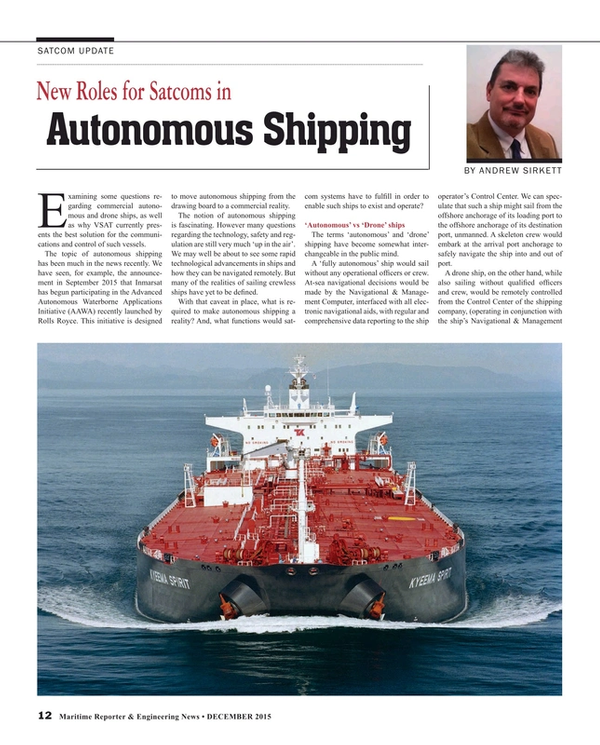 The topic of autonomous shipping has been much in the news recently. We have seen, for example, the announcement in September 2015 that Inmarsat has begun participating in the Advanced Autonomous Waterborne Applications Initiative (AAWA) recently launched by Rolls Royce. This initiative is designed to move autonomous shipping from the drawing board to a commercial reality. The notion of autonomous shipping is fascinating. However many questions regarding the technology, safety and regulation are still very much ‘up in the air’. We may well be about to see some rapid technological advancements in ships and how they can be navigated remotely. But many of the realities of sailing crewless ships have yet to be defined. With that caveat in place, what is required to make autonomous shipping a reality? And, what functions would satcom systems have to fulfill in order to enable such ships to exist and operate? The terms ‘autonomous’ and ‘drone’ shipping have become somewhat interchangeable in the public mind. A ‘fully autonomous’ ship would sail without any operational officers or crew. At-sea navigational decisions would be made by the Navigational & Management Computer, interfaced with all electronic navigational aids, with regular and comprehensive data reporting to the ship operator’s Control Center. We can speculate that such a ship might sail from the offshore anchorage of its loading port to the offshore anchorage of its destination port, unmanned. A skeleton crew would embark at the arrival port anchorage to safely navigate the ship into and out of port. A drone ship, on the other hand, while also sailing without qualified officers and crew, would be remotely controlled from the Control Center of the shipping company, (operating in conjunction with the ship’s Navigational & Management computer). From the shipping company’s Control Center, a drone ship-fleet may be group controlled by qualified senior navigation officers and Marine Electronic / Electrical / Mechanical Engineers. Control of each vessel would be dependent on the constant flow of critical data fed from the vessel to the Control Center. Maritime broadband communications is considerably elevated in its operational importance, because of the volume of data required to be constantly transferred. What Will the Role of Satcoms Be? In order to facilitate the remote operation of drone vessels, data from multiple sources on-board will need to be constantly transmitted from the vessel to the shipping company’s Control Center. These high volumes of data will require broadband-capable satcom equipment. As a minimum, the monitoring and control data would include engine management and control, rudder control, radar scanning and avoidance, speed log, gyro heading, echo sounder depth scanning, GPS and dynamic positioning. We can also speculate the need for bandwidth-hungry live feed from high definition cameras, providing 360 degrees of visibility from the ship’s coning position, back to the Control Center. Any satellite communication equipment used to fulfill these data transmitting and receiving requirements will need to be capable of high data throughput. For purposes of safety, two or three identical systems may need to be installed, in order to provide the all-too-important communication back-up needed, with each satcom system supported by its own independent back-up power generators. Today’s VSAT (Ku-Band or C-Band) satellite communications currently provide the most suitable means of delivering the high levels of data needed to operate autonomous and drone vessels, using maritime broadband services via satellite, for a fixed monthly cost, that can be easily budgeted for. As with all businesses, managing operating costs is crucial to ensure profitability. For autonomous and drone ships, with the costs of running officers and crew gone, other operating costs will significantly rise, and communication costs will be one of them. Anchoring down those communication costs with fixed charges irrespective of fluctuations in the volumes of data transferred and required to control a vessel, makes for an agreeable offering to ship operators. There are good reasons why VSAT communications has continuously grown in popularity over the past seven years. It is precisely the ability to fix communication costs while being able to expand and contract the amount of data used on-board, which is so appealing, and the broadband service lends itself to allowing shipping companies to extend their corporate IT networks to their ships. But just how much constant bandwidth will an autonomous/drone vessel require? And at what cost? We can gain an indication by predicting that a 4Mb dedicated service in forward and return directions will be required. Today, that bandwidth costs in the region of $60 - 80k per vessel per month. That’s probably the cost of employing six to eight European navigating and engineering officers, including the Captain and Chief Engineer. Allowing for the fact that a shipping company probably employs 3 officers per position to provide cover for 12 months, then the cost efficiencies of remotely controlling vessels can start to make financial sense, despite considerable supporting costs that will also have to be introduced. When considering a supplier for maritime VSAT services today, ship operators should look for providers that can offer extensive satellite coverage, offer an extensive range of broadband packages, manage their own allocation of managed bandwidth, and rely on their own numerous ‘Teleports’ to connect vessel networks to global internet services. Add to this, essential 24-hour dedicated support from network operation staff and worldwide regional service centres. Certain providers are now developing partnerships with satellite operators to offer new High Throughput Satellite (HTS) services, improving bandwidth availability without increasing the service cost. Additionally, continuous improvements in the field of data compression are playing a part in improving data transfer efficiency. The commercial ship types that will be most suitable for operating autonomously or as drones, must be those transporting stable, non-hazardous cargo. So, taking the lead will be dry bulk cargo vessels with cargos, which will have neither maintenance or monitoring needs during transportation. Unstable, flammable and explosive cargos such as gas, chemical and oil products are unlikely to be considered suitable. Not only do such cargos need to be carefully monitored, but immediate manned intervention on-board is essential to manage any potential dangers that may arise. Few companies will take on the liability of transporting hazardous cargo within unmanned shipping. The risk of litigation and negative exposure resulting from an environmental disaster following a collision or sinking would be unthinkable. The subsequent expansion of autonomous and drone vessels into other shipping sectors will be totally dependent on the safety record of the early up-takers, and the precedent set with regard to the level of financial efficiencies achievable. Looking at OSVs and workboats as an example, these ships ‘could’ be built for use as drones but the complexity and danger of close-quarter maneuverings of such vessels in heavy seas close to other vessels or platforms is likely to always warrant skilled navigational staff. These types of vessel need to be manned at sea with sufficient cargo handling personnel to fulfill their functionality as workboats in support of oil, gas and windfarm platforms. I would argue it unthinkable that any ship would sail with personnel on-board but without qualified navigational officers to implement safe vessel operation and discipline on-board. For the next 10 years, autonomous/drone ships are likely to be purely experimental, until existing maritime regulations are amended and new regulations are introduced to accommodate the pioneering ship technologies required. By 2025, there may be sufficient technological development and regulatory guidelines in place to allow the first non-experimental autonomous/drone ships to be designed and planned for build and launch during the 2030s. To move autonomous/drone ship development forward a radical review of regulations relating to, international shipping, safety of cargo at sea, and port safety must take place. Industry views on autonomous/drone shipping are mixed. Interesting and exciting as it is to consider a small but growing sector of the worlds shipping being remotely navigated from port to port with no personnel on-board, the shipping community is generally conservative. A reluctance to embrace such technological advancement in ship navigation and control can be expected. However, consideration must be focussed on ensuring that the design of these new ships not only accommodates today’s existing maritime regulations but anticipates those which may need to be implemented specifically for unmanned vessels. It will, after all, be the maritime regulatory bodies that determine the speed with which autonomous/drone vessels are introduced to our seas, not the technology. Ultimately though, it will be the operational increased profitability of using autonomous/drone ships, over those which are fully crewed, which will determine whether shipping companies ever take the huge step of investing in this technology. Andrew Sirkett is Maritime Commercial Manager at satellite communications provider NSSLGlobal Ltd.